Prague has agreed to host the signing of a new U.S.-Russian treaty to reduce long-range nuclear weapons, the Czech Foreign Ministry said Wednesday. 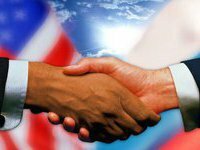 The announcement is the clearest sign yet that Washington and Moscow are close to completing the deal on an accord to replace the 1991 Strategic Arms Reduction Treaty, or START, which expired in December, The Associated Press reported. The Czech side says the US Administration has asked them to prepare everything for a solemn ceremony. Russian officials have so far not commented on the statement, reports Interfax. What is lacking in Wednesday’s announcement is the exact date. However, Yuri Baluyevsky, deputy chief of the Russian Security Council hinted that it might happen before the middle of April, RT reported. U.S. President Barack Obama made a speech in Prague about one year ago in which he called for nuclear disarmament. The signature of the new treaty in Prague would symbolically follow up his speech. The treaty is supposed to be completed by the nuclear security conference that starts in Washington on April 12. Both powers keep about 95 percent of the world´s nuclear weapons. The new treaty would be the first more palpable result of the "new start" of Russian-U.S. relations about which Obama spoke shortly after he assumed the presidential post last year, Czech Happenings reported.